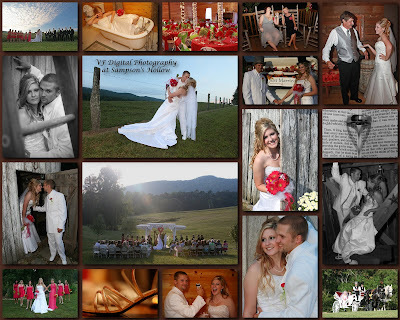 Cassie and Josh were married at Sampson's Hollow in Walland two weeks ago. The place is fabulous, one of my favorite outdoor settings! Janice and her staff will drive the bride and groom and photographer around in golf carts to get to all of the beautiful places on the property to get pictures done timely so they can get to the reception, I love it! Cassie, although spent a tad extra time getting ready, was well worth it as you can see. We had to try and beat the sunset, and I think we were able to get it all in the nick of time. Jenni went with me on this wedding and worked her magic. Irish Bull Entertainment were the DJ's and were great as always.